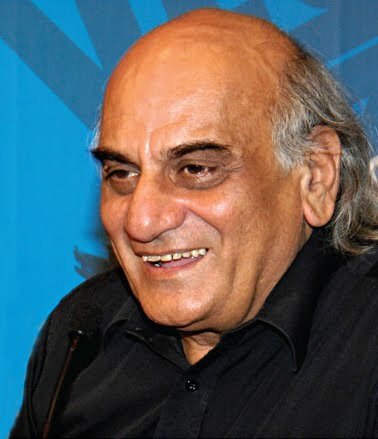 While many Film makers made compromises for their existence, Mani Kaul till the very last breath remained an uncompromising, individualistic creator of films. His films were far ahead of their times which will be always cherished by connoisseurs of good cinema. I was a student at the Poona Film Institute when he had come there to screen his debut film USKI ROTI in 1970. The film was really something we have not seen before on the Indian screen, consisting of lengthy static camera shots and used only one 28 mm lens for the whole film. Many of us didn't like it at all in the first viewing , because of the static lengthy shots and slow pace of the film. But a repeated viewing made us to study the film more deeply, made us to think and not remain as passive viewers. The carefully composed images of light and shade created by K.K.Mahajan in Black and White was another factor that contributed much to the film. I got introduced to him after the screenings and soon became a friend. During his visits to the Institute, which were quite frequent we used to meet along with K.G.George and other friends under the Wisdom tree or at the canteen. You are sure to find him always surrounded by admiring students. Such was his magnetic personality. At that time he was having a love interest with a Tamilian girl Lalitha, (whom he later on married) and he asked me to teach him a few words in Tamil so as to impress her. He used to write down words like " Naan unnai kadhalikkeren " ( "I love you ") on a piece of paper and memorize it with proper pronunciation. Later on I have also visited his house "Janaki Kutir" at Mumbai and enjoyed his and Lalitha's hospitality. Though he was my senior, he introduced me to his wife Lalitha as his Tamil teacher! Ravi Menon who was my batch mate at the Institute had done the lead role in Mani's Hindi film "DUVIDHA" before he made his debut in Malayalam films with M.T Vasudevan Nair's National Award winning "NIRMALYAM" for which I was the cinematographer. Ravi used tell me a number of interesting incidents from his shooting experience with Mani Kaul's team. I lost touch with Mani for a number of years after I relocated to Thiruvananthapuram. A few years back I happened to meet him during the International Film Festival of Kerala and that was our last meeting. He passed away on 6 th July 2011. I have lost an old friend and great soul and Indian Film Industry had lost a Master Film maker!